In 2012 a project was conducted between Sweden and Bangladesh centering on concerts, masterclasses and workshops in Dhaka by Swedish musicians Mats Möller (flute), Eva Lindal (violin) and Johannes Möller(guitar). The project was the initiative of two organizations in Dhaka working to promote musical skills, knowledge and excellence – The Bangladesh Shilpakala Academy (BSA) and the Classical Music Academy of Dhaka(CMA). These organizations are working together to achieve a milestone in the establishment of ”classical and contemporary” (composed) music, incorporating western and eastern traditions and instruments – a vision to form Bangladesh’s first symphony orchestra. One obstacle in achieving this is the vast lack of higher-educated musicians and music pedagogues. On return from this project, Mats Möller and Eva Lindal contacted SMI in order to gauge our interest for an exchange project, centering on the development of a higher education degree program at BSA offering the training of students for qualified higher education music pedagogy in their major instruments. SMI has in contact with BSA and CMA established a common interest for this project and CMA has already identified at least seven music students willing to become a first cull studying for such a degree, which would then potentially form a first cull of qualified staff. This in addition to enrolments already at BSA. Several of these students have backgrounds with previous study both in Bangladesh and overseas. Some of them already have higher education degrees in areas other than music. We are convinced that the project will lead to quite a few more interested students and potential teachers to future student culls. SMI has initiated a Linnaeus Palme Exchange Programme with BSA (National Academy of Fine and Performing Arts). 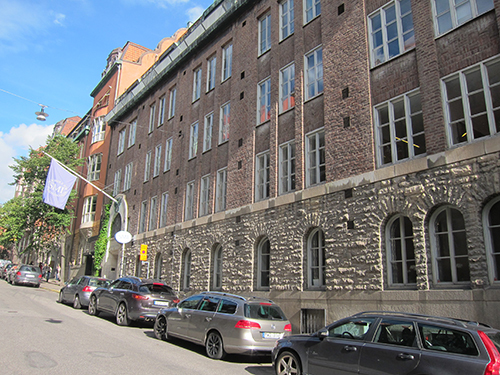 In mid-March 2014, the Swedish International Programme Office for Education and Training decided upon the thirteenth round of Linnaeus Palme Exchange Programme grants, for the period 1 July 2014 – 30 June 2015. SMI was awarded SEK 40 000 to launch the collaborative exchange of teachers and students. The project has received continued funding for 2015-16 with SEK 123 970. More information about South Asia related Linnaeus Palme programme grants for 2015-16. The idea behind the project is to provide Bangladesh with a degree award at the undergraduate level providing formal qualifications as a music pedagogue in a major instrument/song. Graduates will be not only skilled musicians in their own right as a result of the degree program, but have extensive knowledge on the methodology of learning their principle instrument in all stages of individual, group and ensemble learning. Cross-disciplinary orientation with e.g. dance is envisaged as well as collaboration across instruments and genres, in close connection with the traditional music of Bangladesh. The establishment of the degree award will provide much needed skills for the development of an “ecosystem” for music education in Bangladesh, with music schools training the musicians and music pedagogues for the future in Bangladesh. One effect of the project identified by the partners in Bangladesh is the forming of a national Bangladesh Symphony Orchestra, a consequence of providing valuable music education methodology at the higher education level. At this stage there is no official performing orchestra in the country. In Sweden the project is expected to provide valuable insight to the key components necessary to offer higher-education qualifications when working with students not exposed to music education in a western traditional sense. The goal is to be able to develop a Bachelor degree award that provides the possibility for musicians from non-western cultures to study and become formally qualified music pedagogues in their primary instrument, while lacking the “usual” pre-requisite knowledge that European students are expected to have as an entrance requirement. In June 2015, a first planning trip was made to Bangladesh by Ian Plaude, and Michael Schlyter, Head of Woodwinds Methodology at SMI. They had meetings with several institutions of music in Dhaka, first with Zubayeer Swani, voluntary coordinator of the project in Dhaka and graduate in composition of the Gotland Composer School and the Royal College of Music in Stockholm. He studied in Sweden 1999-2006 and has knowledge and experience of the Swedish Higher Education system. He is a successful singer, arranger and composer in Bangladesh and also frequently produces TV-productions. He is familiar with and has had collaborations with many of the musicians and music teachers that are working in Dhaka, both through the BSA and independently. They then met Liaquat Ali Lucky, Director General of the Bangladesh Shilpakala Academy BSA (National Academy of Fine and Performing Arts), and also Soma Farhana Rahman, Assistant Director, Dept. of Music, Dance and Recitation. The BSA has the government mission for promoting activities within the arts as well as providing arts education and professional development throughout Bangladesh. The BSA has a local committee in each of the 489 sub-districts of the country, being able to bring arts performances, exhibitions and courses locally to each of the 64 districts. The BSA has also the mission to provide competent teachers to provide arts education. It is an ongoing challenge to find teachers that have both artistic ability and pedagogical skills. The BSA welcomes therefore the partnership to be able to educate professional teachers within music that can teach music to children and youth in Bangladesh. Plaude and Schlyter with BSA students on photo. 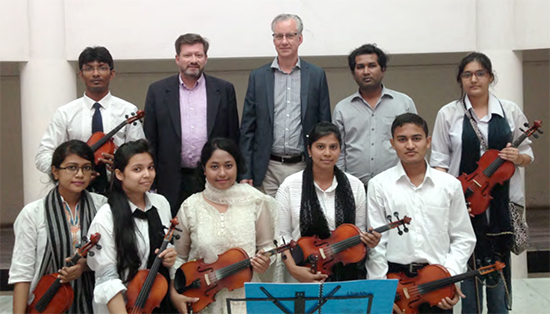 Next day they visited the Government Music College (GMC) – affiliated with the National University of Bangladesh, and met the Principal, Shameema Parveen. 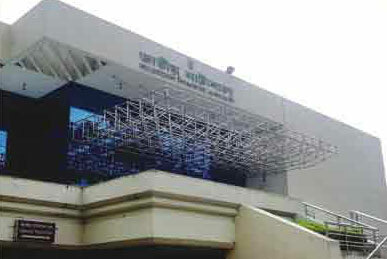 The National University of Bangladesh was established in 1992, and today more than two million students are studying in over 2150 colleges/ institutions affiliated to this university including GMC. GMC provides degree awards in music performance principally in Bangladeshi and Indian traditional and folk music, focusing on traditional instruments, song and violin with which there is an employed expertise. A degree at GMC also includes generalist knowledge including mathematics, language and literature studies, economics and social studies as well as specific music studies. Acting under the supervision and governance of the Ministry of Education, the GMC has to seek permission for all accredited course and degree work. The SMI duo then visited the Classical Music Academy (CMA) – mentioned above – an independent music school training musicians and performing western classical music, led by Iftekhar Anwar, graduate with a Master of Performing Arts in Classical Guitar from the Arizona State University, USA. Photo from the meeting. Finally, a meeting was held with Mia Hallén, First Secretary of the Embassy of Sweden. The purpose was to inform the Embassy of the project and its goals, and seek possibility for support and assistance with the project. Read a detailed and informative report on the Dhaka tour. 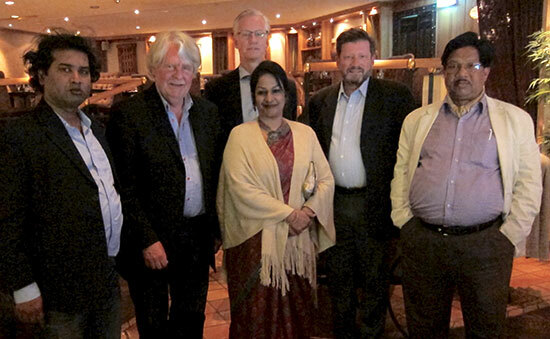 Swani Zubayeer, Lars Eklund, Michael Schlyter, Shameema Parveen. Ian Plaude and Liaquiat Ali Lucky. In September 2015, a reciprocal planning tour to Sweden was made by the Bangladeshi partners Liaquat Ali Lucky, Zubayeer Swami and Shameema Parveen. On Tuesday 22 September, SASNET deputy director Lars Eklund was invited to meet Ian Plaude, Michael Schlyter and the Bangladesh delegation to discuss the ongoing Linnaeus Palme exchange programme. It is now running, but with some obstacles and that was the main reason for inviting SASNET. Michael Schlyter is working only part-time at SMI, but also teaching at the Royal College of Music and a Stockholm high school. His work situation illustrates the problem for SMI and other university departments in the field of performing arts to run a Linnaeus Palme programme. The idea is to send teachers to teach at the collaborating institution in for example Bangladesh, but for a part time employee this is not easy since he/she then has to take unpaid leave from his/her other work places. The discussion did not result in any good suggestions to solve this problem, but instead Lars learnt a lot about the work of SMI – which is mainly to educate Swedish music teachers, and get good contact with two important institutions of music in Bangladesh. The Bangladesh Shilpakala Academy has impressive activities going on in all parts of the country, that is in every district and almost every sub-district.